The IK Multimedia iRig Mic Lav is a compact and affordable lavalier microphone that allows you to record professional-quality audio straight to your iPhone iPad and Android devices. 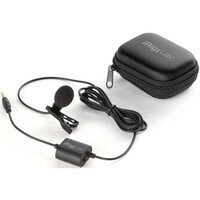 Each iRig Mic Lav features an omnidirectional condenser capsule and foam pop shield on-board headphone monitoring output secure mounting clip and generous cable length. Designed for videographers intrepid journalists and dedicated podcasters alike this innovative microphone captures a 30Hz to 16kHz frequency range whilst eliminating unwanted sounds. The iRig Mic Lav comes complete with a suite of recording apps perfect for everything from recording journalistic interviews to making podcasts while on the go. This entry was posted in Ik Multimedia and tagged PA-DJ-and-Lighting. Bookmark the permalink.